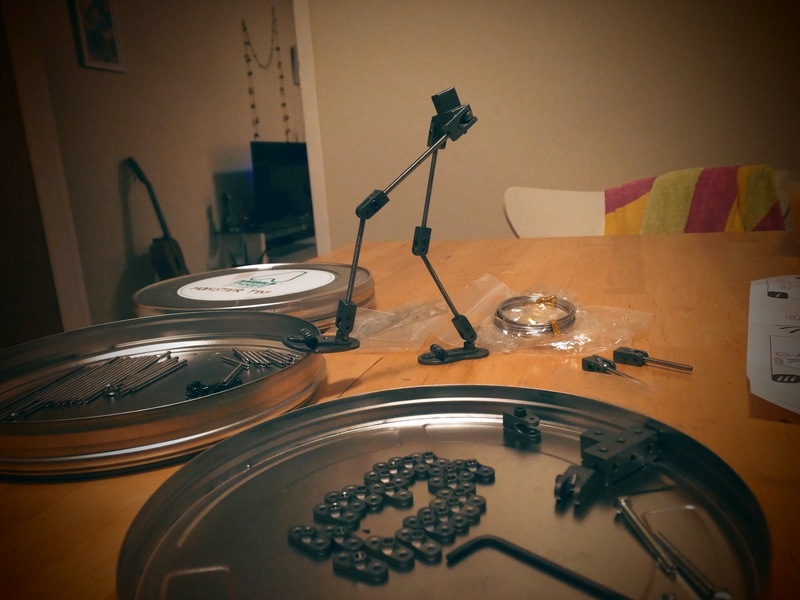 One of the starting points for me to get into stop motion animation and building a home studio was that I came across some armature kits, shortly after I started doing simple stop motion films with my smart phone. At first it seemed a pretty steep price for a hobby, with one of the cheapest yet professional armature kits that I found in a shop located in the UK, starting from GB£80 preorder price plus shipping to Australia. 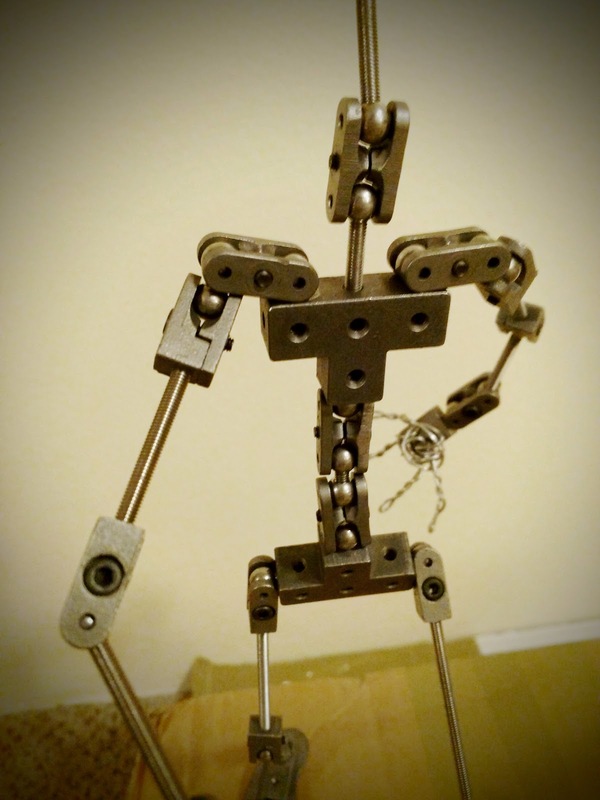 There are many different armature options, but obviously this is quite a niche product. 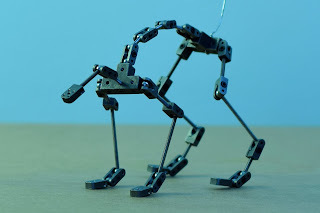 There are instructables for DIY armatures, but most of what I found was wire based. 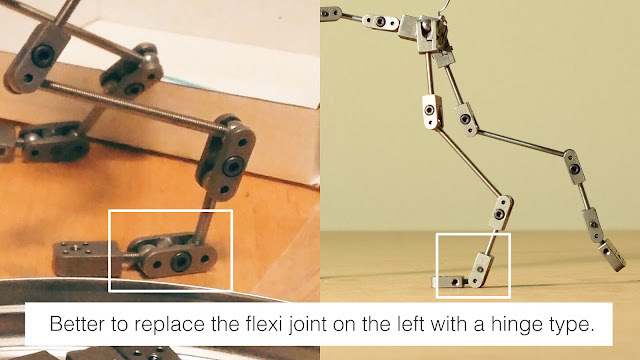 I really wanted proper joints, so I didn't try this, and I didn't go so far to make joints from scratch. 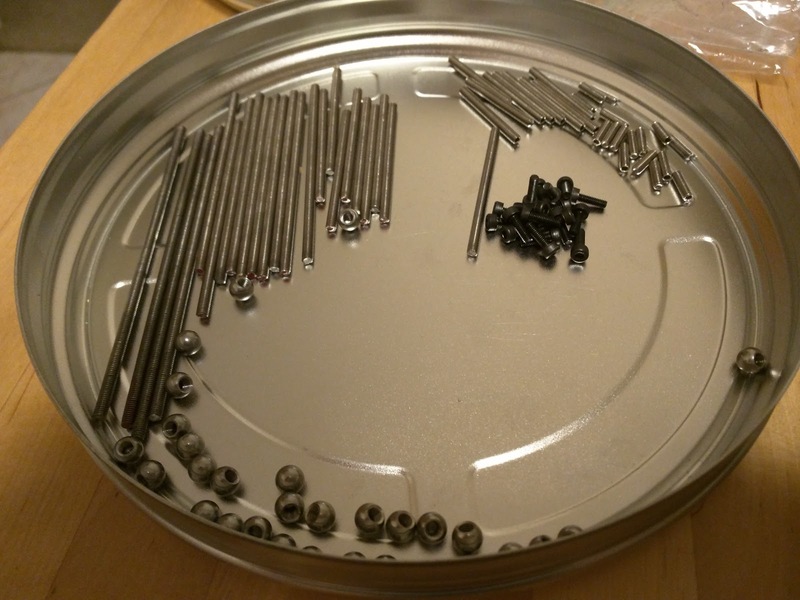 I had a look at the local hardware shop, but I couldn't find any suitable parts to make an armature myself. Eventually I just ordered two Anibild Three Monster Tin kits and the day they arrived felt like Christmas! 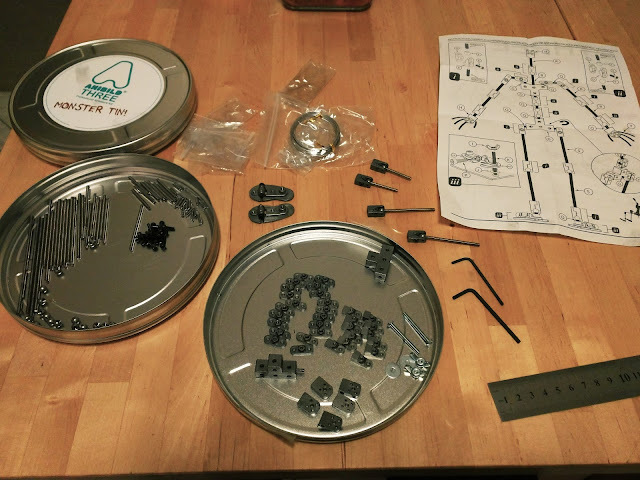 Complete Anibild Three Monster Tin kit with part list and instruction sheet. T-shaped shoulder / hip pieces, joint parts, end pieces (hands or paws) and tie down screws. I have no experience with other armatures, so I can't really compare. I'm happy with the Anibilds, they are very sturdy and the tension of the joints can be easily adjusted with an included hex wrench. The screw thread is M3 size, so it's potentially compatible with other items that aren't part of the kit. 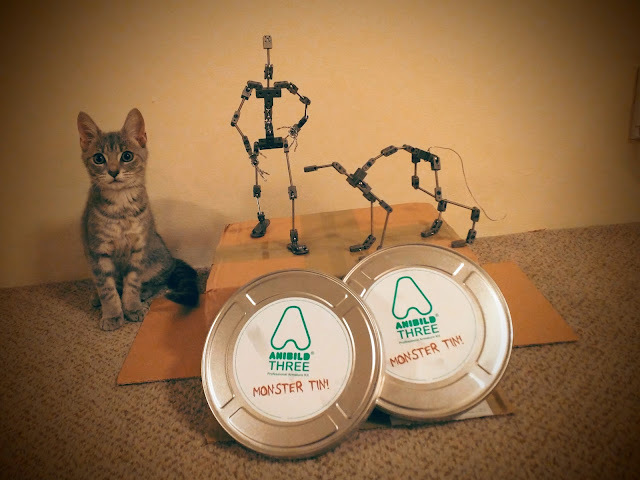 The Monster Tin kit includes enough parts to make a variety of armature types, humanoid two-legged and quadruped (four-legged) creatures included. Each kit has two T shaped pieces for chest and hips. It also comes with two feet for humanoids with two tie-downs each and several end pieces for hands or paws that also have tie downs. A tie down is basically a screw hole to fix the armature to the stage, which is really important to animate them, but more on animating in future posts. There are two types of joints with different restraints. A joint on the elbow for example only allows the movement like a hinge, while one at the wrist also allows for rotating the hand. For the animation process it's very helpful to have these different types of restraints. Joints basically consist of two metal pieces that grip a metal ball which is connected to a rod with a screw thread. The hinge type has one ball, the one for freer movements has two. It is recommended to permanently affix the balls with the threaded rods and possibly rods with the T-shaped chest and hip pieces using a thread sealant like Loctite. I only did this with those joints that really required it as I want to reuse the armatures and build different types from the parts. 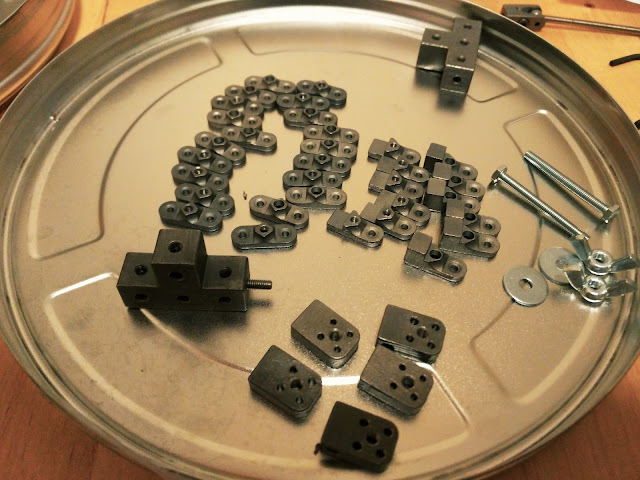 So I did seal some of the short rods that connect the upper arm joints with the shoulder and the upper leg joints with the hips. I found it almost impossible to animate without these being firmly fixed. I also sealed the feet with a short rod and a metal ball because I can't see any other way to use the feet. You'd never have an ankle joint that's too far away from the foot. Apparently, if you ever wanted to remove permanently fixed items, it should be possible by heating up the material with a butane gas torch. To assemble and disassemble I suggest you have some pliers ready. I never used them directly on the armature but always put some cloth between so that I wouldn't damage the thread or ball. I'm sure there are other armature types that don't require sealant and where rods are not threaded but where balls and rods are one piece. I don't find the threaded version a disadvantage, though. The Monster Tin kit also has a huge variety of different length rods, so you can make anything from a giraffe to a dachshund. It would be good to hear what others think of Anibild or what armatures people prefer. 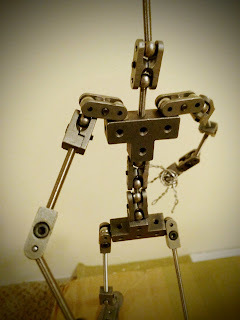 For me Anibild was simply the most affordable option in the professional armature range with enough parts for variety. After affixing a few parts animating worked really well. I had one or two other joints that still felt a bit loose, but as I didn't want to lock them in permanently I just stuffed a bit of tissue paper between rod and metal ball and this makes it tight enough. 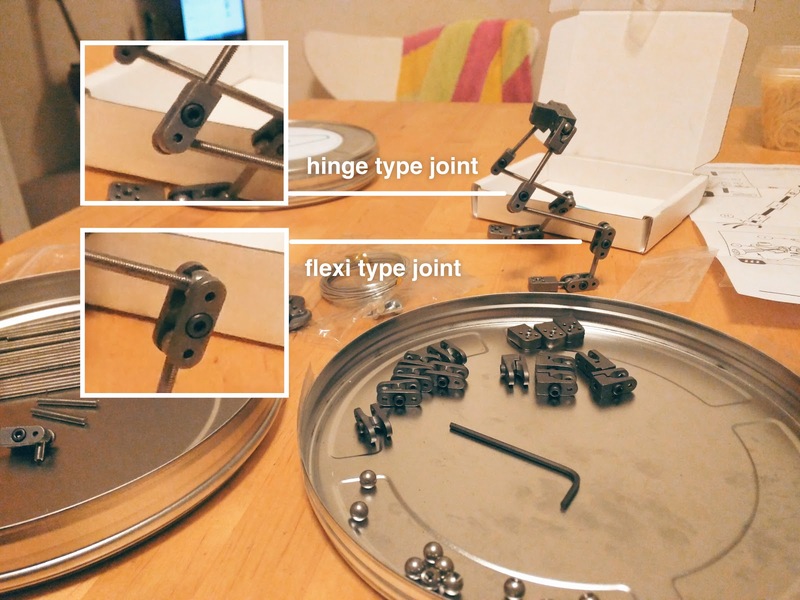 It's pretty easy to assemble the armatures. From the first kit I made a humanoid based on the attached instructions. From the second set I made a quadruped creature. For my learning I based it on a cat which initially is probably easier to animate than to attempt fantasy creatures such as dragons or extinct animals like dinosaurs, simply because there's more reliable reference material available. Also, I have two cats, so I'm quite familiar with the movements (even though they are not good at taking directions). 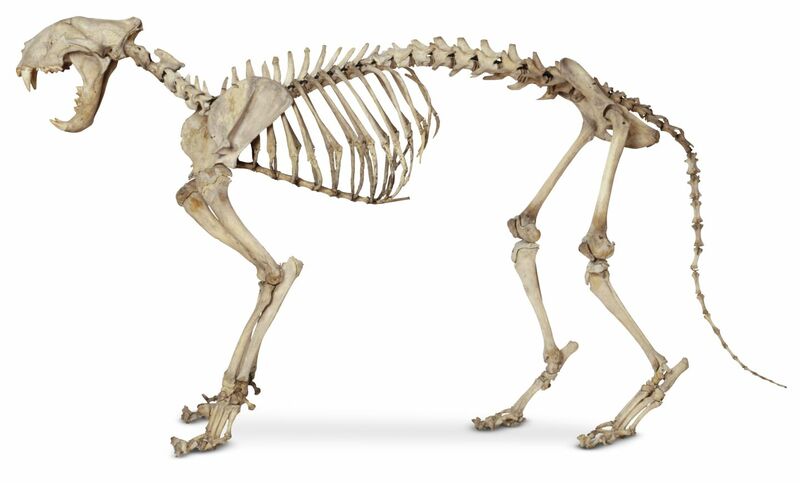 The best reference was the picture of a cat skeleton, and my armature matches it quite well. A bit later I added an additional joint to the spine to make it longer, and also replaced one of the foot joints with a hinge type. In the next posts I'll focus on a human walk cycle, followed by a quadruped one of a cat. They aren't perfect yet, but I'll try to convey what I learned.